MSC Magnifica, one of the biggest cruise liners in the world, has docked in Maldives. Over 1,000 passengers disembarked the ship and came onto Male on Wednesday, allowing the capital city to break its record for the most number of travellers to have come on shore from a cruise liner on a single day. MSC Magnifica docked in Male with over 2,500 passengers, with several of them travelling to resorts located close to the capital city. The ship, which is affiliated with local travel agency Travel Connections Maldives, is expected to leave the Maldives on Thursday. A Musica-class cruise liner operated by MSC Cruises, MSC Magnifica was constructed by STX Europe in Saint-Nazaire. The ship was launched in January 2009, completed in January 2010, and entered service in March 2010. The vessel is 293.8 metres (964 ft) long, with a beam of 32.2 metres (106 ft). The 93,330-gross ton vessel can reach a maximum speed of 23 knots (43 km/h). MSC Magnifica has 1,259 cabins — 2,550 passengers can be carried at double occupancy, whilst 3,605 can be carried at full capacity. The ship operates with a crew of 1,027. The ship has 13 passenger accessible decks, three swimming pools, a gymnasium, spa and wellness centre, a 1,250-seat Art Deco-style theatre, casino, cinema, bowling alley, and a number of dining areas and bars. MSC Magnifica’s trip to the Maldives is part of her maiden world cruise. 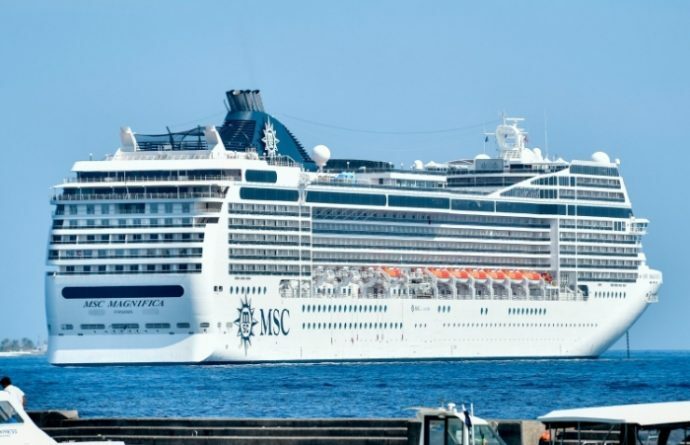 Over the course of 119 days, MSC Magnifica will visit six continents, 32 countries and 49 destinations, before returning to Genoa on 3 May 2019.